Chakra Aroma Oils mr. steam® introduces specially formulated essential oils extracted from organic flowers and plant material. The mr. steam Chakra blends may support the body's specific needs. Feeling a bit sluggish? The essence of Red Vitality may help you feel invigorated. Are you feeling inhibited? Introduce mr. steam's Energy Orange essence into the steambath for a motivating experience that may help lessen sexual inhibitions. Having difficulty staying focused? Introduce the Yellow Awakening essence into the steam room, which may help improve memory and concentrations. Feeling stressed out? Infusing the steam with mr. steam's Green Harmony essence may help to reduce stress and restore a sense of balance. Having a creative block? Bringing in the Mystic Indigo essence may help enhance your creative intuition. Looking for a way to unwind? Introducing the Violet Nrivana essence may help calm your agitated nerves. mr. steam® introduces specially formulated essential oils extracted from organic flowers and plant material. 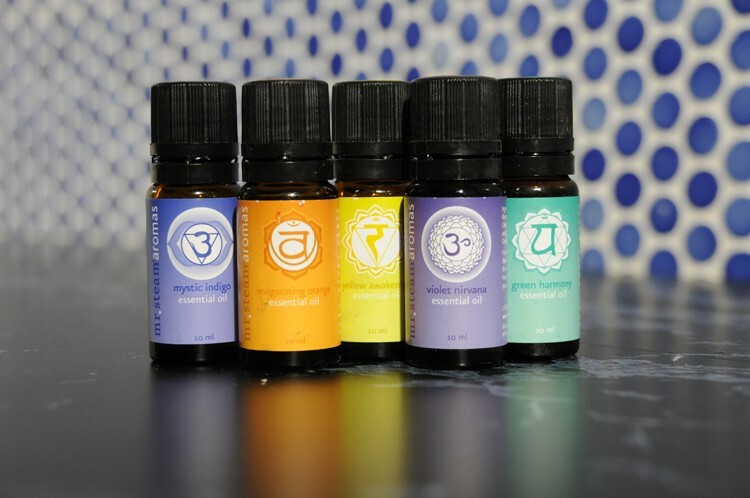 The mr. steam Chakra blends may support the body's specific needs. The essence of Red Vitality may help you feel invigorated. Introduce mr. steam's Energy Orange essence into the steambath for a motivating experience that may help lessen sexual inhibitions. Introduce the Yellow Awakening essence into the steam room, which may help improve memory and concentrations. Infusing the steam with mr. steam's Green Harmonyessence may help to reduce stress and restore a sense of balance. Bringing in the Mystic Indigo essence may help enhance your creative intuition.